Don has spent his entire professional career teaching and coaching at various levels. Don was a high school math teacher for 32 years. He was also a head football, track, and wrestling coach, and an assistant football coach at the college level. 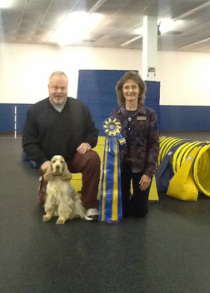 Don is now using that knowledge base to work with agility handlers and their dogs. He has competed in agility for 7 years with his English Cocker Spaniels. His first agility dog Cassie was the first English Cocker to earn a PACH. Cassie is now retired and Oliver has stepped in her place. Ollie has earned 2 MACHs and has been ranked as one of the top ten Cockers in the country. Don started instructing agility 3 years ago and believes in some basic principles that have proven to be successful in all areas of teaching and coaching. First a strong consistent application of fundamentals is essential. Don spends a large part of the class time teaching and reviewing the necessary skills needed to navigate an agility course. Secondly that instruction and handling must be tailored to the individual. There is no one size fits all. Each team comes with their own unique set of skills and obstacles. It is the job of the teacher to help the team find what fits best for them, and to present opportunities to practice those skills. Third the instructor should be actively involved with the student at class and trials. Fourth that the mental game is as important as the physical, and that by using visualization and imagery you can greatly improve your results.